I recently returned from a month’s holiday in New Zealand. As a one-man software company I still have to check my email every day, even on holiday. Here are a few tips from my experiences of running my business from a laptop whilst travelling. In theory you can run your business from a Blackberry or a mobile phone that supports email. But it is impossible to answer some support emails if you can’t run your own software. So I took a Toshiba laptop PC with a 13 inch screen with me. I find a 13 inch screen is a good compromise between portability and ease of use. Much bigger and it would have been too bulky. Much smaller and I would have struggled with the screen and keyboard. The laptop contained my licence key generator and customer database. I owe it to my business and my customers to keep these secure and the Windows password is no protection at all if someone gains physical access to your machine. So anything sensitive was encrypted using the free Truecrypt software. Whenever I brought the laptop out of hibernation or restarted it I just had to type the password to mount the Truecrypt volume as a virtual drive. I took a combination laptop lock, but I rarely used it. 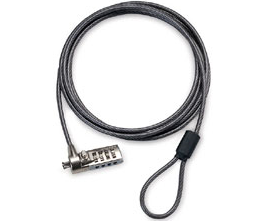 The problem with laptop locks is that the only things strong enough to secure your laptop to are usually in plain view, and a laptop left in plain view is a bit of an invitation. Locked or not. I am also not convinced how strong the laptop security slot is. I suspect an attempted theft would wreck the laptop, even if it wasn’t successful. So I generally prefer to keep the laptop with me or hide it somewhere a crook wouldn’t think to look. I have since found out that laptop locks aren’t even very secure (see here and here). There are still occasions when a laptop lock is better than nothing though. Incidentally, don’t rely on that padlock on your hold baggage either. The laptop was also invaluable for playing Thomas the Tank Engine DVDs (using Windows Media Player) to keep my little one occupied for part of the very long flights and for backing up photos from the digital camera. I also took a universal power adapter. I have a traditional Targus laptop bag with a shoulder strap. But I have found this uncomfortable for carrying a laptop any distance due to the uneven distribution of weight. It also makes it extremely obvious that you have a laptop. A fact I would rather not advertise. For this trip I purchased a Swissgear Hudson laptop rucksack from Swiss Army knife manufacturer Wenger. It was much more comfortable to wear with the weight distributed across both shoulders and left both hands free for dealing with passports, boarding passes and a bored two year old. It was small enough to take on to an aircraft as hand luggage, but surprisingly spacious. It also had some useful extras, including: a carry handle, a breathable back and a compartment for an MP3 player. I was impressed with the quality of the construction and finish. My only quibble is that there wasn’t as much padding around the top and bottom of the laptop as I might have liked. So I wrapped my laptop in bubblewrap for additional protection. But on the whole I would recommend this bag highly for travelling. As well a backup on DVD I also took a 2 Gig USB memory stick that contained everything I would need should my laptop malfunction or be stolen. This included copies of my licence key generator, customer database and various passwords. All the sensitive files were encrypted using the free Axxcrypt software, except my passwords which were encrypted using the free Keepass software. The memory stick also stored various third party software installers (including Axxcrypt and Keepass). I kept the memory stick on a lanyard around my neck when I wasn’t sleeping. I also stored an additional encrypted back-up on a secure server. Trying to find holiday accommodation that was the right size and budget, in the right location and free at the right time was problematic. Insisting on broadband Internet as well was a step too far. I also wasn’t keen on relying on broadband at accommodation. What if it didn’t work? Relying on Internet cafes seemed an even worse idea. What if I couldn’t find one? And the security issues of using Internet cafes are very real. So I needed my own mobile Internet access. The roaming charges for using my UK three networks mobile Internet in New Zealand are an outrageous £6/MB. Vodaphone has more sensible roaming charges for some plans, but I couldn’t justify the high monthly price for the occasional trip abroad. So I tried to find a company that would rent me mobile data access in New Zealand for a month, without success. In the end my brother-in-law very kindly sorted me out with a USB mobile modem and a 1GB/mo data plan with Telecom New Zealand. He picked the modem up cheap second-hand on trademe.co.nz and the data plan was of the order of $70NZD/mo, with no minimum term. So, rather than paying >£1000, I ended up paying about £50 (thanks Derek!). There is definitely a business opportunity for someone there. I am glad I didn’t rely on broadband at the accommodation. It turns out that most of the New Zealand ISPs have restricted SMTP access to prevent spam. So I could receive email via IMAP when plugged in to an xtra.co.nz broadband cable, but I couldn’t connect to their SMTP server to send email. Thankfully I didn’t have this problem with the mobile broadband or I would have been stuck with webmail for a month (the horror!). Mobile coverage is patchy outside the bigger cities in the South Island of New Zealand, due to the low population density (sheep can’t afford broadband). But I was able to get some sort of signal everywhere we stayed. This might have been helped by the aerial attached to the mobile modem. During the month a I used approximately 40% of the 1GB allowance. I could have used quite a lot less, if necessary. Stopping over in Singapore I just purchased wifi access from the hotel. It was quite expensive, but I didn’t need it for long. Wifi and hardwired Internet access are available for free in Singapore airport (I couldn’t get the wifi to work, so I just plugged in a network cable). Running an Internet-based business while travelling isn’t that difficult, with a bit of planning. I doubt my customers even realised I was on holiday. What are you waiting for? PS/ New Zealand is lovely. Truecrypt can also encrypt the whole OS, but that seemed excessive for my requirements and I wasn’t sure what impact it would have on performance. If Truecrypt is so easy to set-up and use, why is it apparently beyond the capabilites of the UK government to encrypt sensitive data? 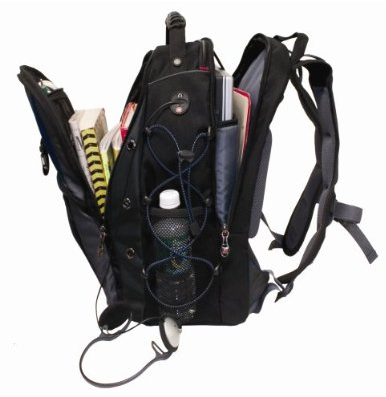 This entry was posted in article, microISV, reviews, software, tools and tagged axxcrypt, hudson, keepass, laptop, laptop bag, laptop rucksack, microISV, mobile broadband, new zealand, roaming, swissgear, travel, truecrypt, usb stick, wenger on 13 April 2009 by Andy Brice. Mobile Internet access in New Zealand? I am thinking about a trip to New Zealand with the family (my wife is a Kiwi). As a microISV I need Internet access to keep the business running. I might be able to rent accommodation with broadband or find Internet cafes, but I would like to have mobile Internet access as a back-up. Unfortunately it looks as if my UK mobile Internet provider doesn’t even support roaming in NZ. Even if I swap to another UK provider, roaming costs would probably be prohibitive. Ideally I would like to just rent a data card in NZ for a month. But a search on Google turned up nothing, apart from one service apparently only available to Australians. My only other thought is to ask one of my wife’s relatives to sign up with vodaphone.co.nz for their ‘no term’ mobile broadband plan, then cancel at the end of the trip. I will probably have to buy a new data card as well, as I doubt my Three Networks Huawei USB modem and SIM would work with Vodaphone NZ. Any Kiwis reading this? Suggestions would be welcome. This entry was posted in microISV, miscellaneous, software and tagged broadband, data card, internet, mobile, new zealand, nz on 11 November 2008 by Andy Brice.